Sgt. Maj. Doug Reed and his wife Jana were the featured speakers at a Veterans Appreciation Dinner Saturday at Cable Road Alliance Church. LIMA — It was April 11, 2010, when Sgt. Maj. Doug Reed’s life changed forever. While in Afghanistan serving with the Ohio Army National Guard, Reed took a shot from a rocket-propelled grenade directly on the right side of his face, smashing it. “To be completely honest with you, I don’t remember any of that incident. I guess the impact was so impactful that, basically, I had amnesia for 55 days. So until I woke up in the hospital, with my wife already there, I didn’t know what happened, and if I hadn’t read accounts of what actually happened from the guys on my team, then I wouldn’t have been able to put it together,” said Reed. Reed was the keynote speaker Saturday night at a Veterans Appreciation Dinner at Cable Road Alliance Church in Lima. “My message, honestly, is we all have issues. Things happen to us, and it’s your perspective and your walk with God that gets you through life’s challenges. It could be a small challenge, it could be a large challenge, it doesn’t really matter. As long as you give it to God, then things will turn out the way he wants it to, and that’s what we’re all here for,” said Reed. Military doctors used their skills to put Reed’s face back together again. “We’ve pretty much quit counting at 30 surgeries. We had been told by the doctors there’s more surgeries I could have if I elected to have them. The way I see it, I’m alive, I run a fairly constant 98.6 [degree] temperature and I have a pretty good pulse, so I have just about everything that’s going to keep me alive whether or not, for lack of a better word, I’m prettier or not,” he said. During Reed’s ordeal, he and his wife Jana were tested in their faith. “Most of the doctors, God bless them because they’re being honest, but honesty sometimes isn’t the best thing that my wife needed to hear. They kept telling her on most of the phone calls, ‘We don’t expect him to live,’ and I didn’t know anything was going on, and she was the one that had to deal with all of that stuff,” said Reed. “Through the whole time, I just felt that if he wasn’t supposed to live, he would have died on the battlefield, because when I saw him a week later, it was very evident you could see the blood coursing through the [jugular] vein, and I knew right then and there that God’s got something in store for us. I don’t understand it and I don’t know why, but let’s just hang on for the ride,” said Jana Reed. https://www.limaohio.com/wp-content/uploads/sites/54/2018/11/web1_Vets-Dinner-orig.jpgSgt. 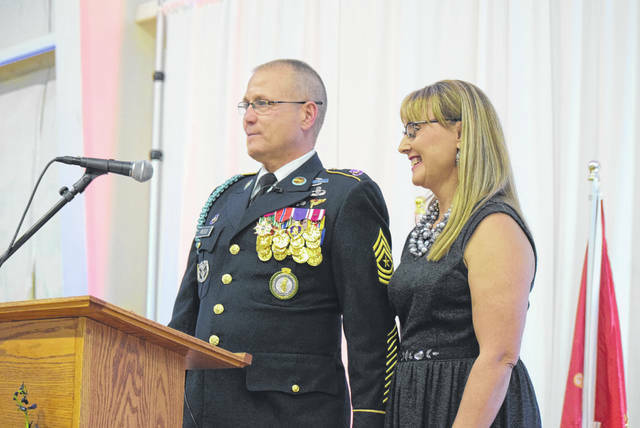 Maj. Doug Reed and his wife Jana were the featured speakers at a Veterans Appreciation Dinner Saturday at Cable Road Alliance Church.